Home » Blog » Whither the EU..? As the Slovak-Hungarian Most-Hid (Bridge) party, the junior partner in Fico’s coalition government, has said in a statement: “Britain’s decision completely changes the Slovak presidency, it becomes the number one issue… It is extremely important that Slovakia rises to the challenge of this presidency, for never before has a presiding country faced such a tough task”. Whether or not the UK goes through with a complete ‘hard’ Brexit in quite the way Nigel Farage and Michael Gove called for – and, according to The Guardian’s Jennifer Rankin, US secretary of state John Kerry certainly believes that can be avoided – the EU has huge challenges it must face or it risks falling apart, with dissension between its leaders and more and more far right parties demanding their own version of Brexit. Epitomised by German foreign minister Frank-Walter Steinmieir and his French counterpart Jean-Marc Ayrault, they would like to see the EU become a political union based around the euro. The Spanish government is reported to be keen on further integration, as is Hollande. Pretty much all the leadership of the so-called ‘Visegrád 4’ (V4) – Solvakia, Hungary, the Czech Republic and Poland – want a decentralisation of the EU with more powers being repatriated to national governments. Leaders like Germany’s Angela Merkel and Dutch prime minister Mark Rutte are cautious about change and have something of a ‘wait and see’ attitude towards what kind of changes might be needed. I couldn’t agree more with Hoffman, having bemoaned Europe’s poor leadership in Austerity and the Euro – an Appalling Lack of Quality Leadership back in 2012. 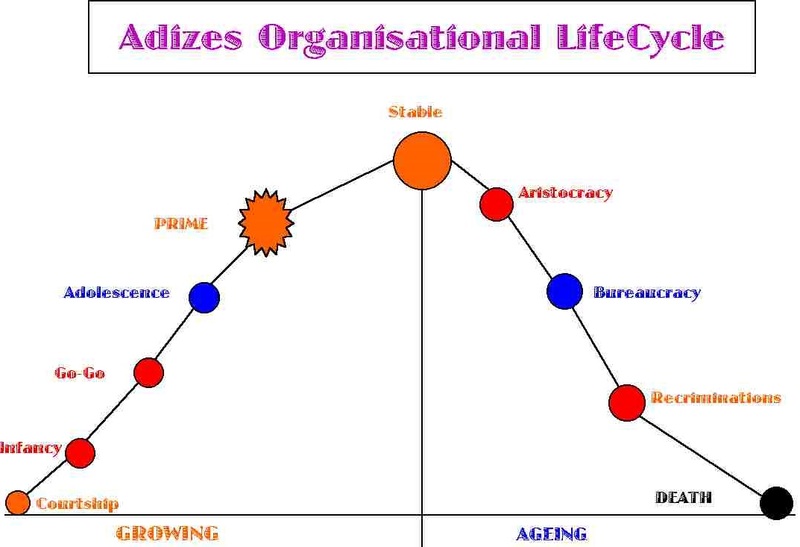 Hoffman, in describing an institution where form is more important than function, effectively places the EU in a state of Bureaucracy on Ichak Adizes’ (1987) Organisational LifeCycle. Dominated by the BLUE vMEME running Procedure and Little Detail meta-programmes, it is long past its creative Prime and will eventually die unless there are visionaries who can see how to pull it back to Prime. Yet for the EU to continue, it needs a complete restructuring that meets, in major part at least, the sometimes very different concerns of its member states and enables it to maintain itself in Adizes’ state of Prime. 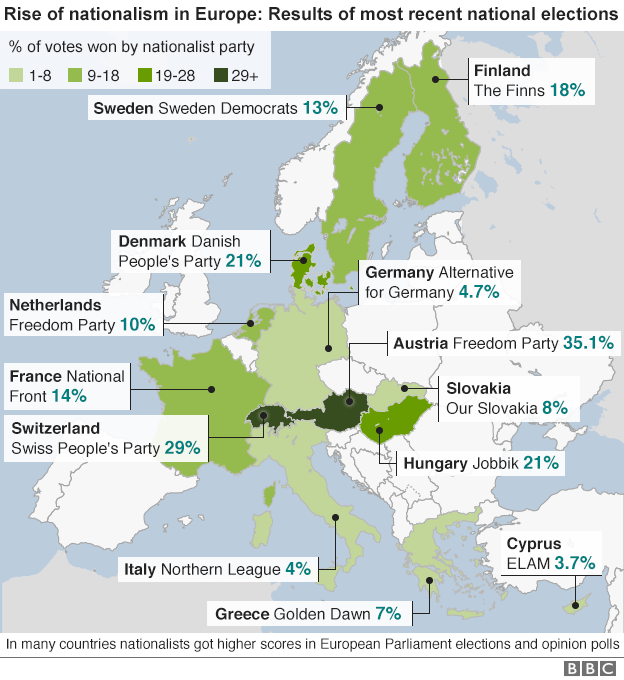 As can be seen from the graphic below, far right and nationalist parties are doing better electorally than at any time since World War II, with some (Denmark, Finland, Hungary and Austria especially) reaching or approaching thresholds of governmental influence. This growth in far right nationalism is due to a PURPLE/BLUE vMEME harmonic being exploited by RED-driven demagogues like Le Pen and Hungarian prime minister Viktor Orbán, primarily through the issue of migration. As discussed in Is Racism Natural…? and The Trouble with Tribalism…, it is easy for the PURPLE vMEME at a cultural level to be feel threatened by the ‘invasion’ of another tribe. When the ‘invaders’ look or sound different, that boosts the sense of distinctness that leads to labelling the ‘others’ in terms of stereotypes, as per Social Identity Theory. When the ‘invaders’ are perceived to be ‘stealing’ resources (from jobs to benefits to appointments at doctor’s surgeries), then conflict is more likely, as per Realistic Conflict Theory. This is especially so if the resources are seen to be scarce, as they are in many European countries after 5 years or so of austerity. It can then become your duty to save your community – even your country – by getting rid of the ‘invaders’. Thus, a sheen of BLUE righteousness is given to PURPLE’S discriminations against the ‘others’. Immigration was certainly a key factor, exploited by Farage and Boris Johnson, in the UK’s EU referendum – as outlined in So the Turkeys did vote for Christmas?!? With regard to the post-referendum surge of racial abuse incidents in the UK, commentators like The Independent’s Jon Stone (2016a) have pointed out that the abuse is not just directed at EU nationals but also at non-white/ethnic minority British citizens who are now ‘othered’ as not being part of the ‘real’ British tribe – ie: indigenous white. It remains to be seen how much British nationals will be abused in other EU countries as the Brexit negotiations get under way…but I’ve already heard (anecdotally) of one Brit, married to an Italian and living in Rome, being told to “go home” by local residents. Certainly xenophobia is on the rise across the EU, fuelled in part by fear of Islamist terrorism and in part by the migrant crisis. Way back in 2010 Alan Tonkin’s classic Global feature The EU: an Organisation divided by Values outlined clearly the values divides amongst EU members. He saw the Eastern European countries as being dominated culturally by the BLUE vMEME with authoritarian governments while the governments of Western European countries like France and Germany ran off a BLUE/ORANGE vMEME harmonic. However, the recent actions of certain leaders have widened the values divides to the point where some members of the EU barely understand each other any more. Thus, Merkel’s GREEN led her to welcome hundreds of thousands of Syrian refugees into Germany last year and to demand that other member states take their share too. Orbán, a RED/BLUE autocrat of the old Soviet kind and a known admirer of Vladimir Putin (Rick Lyman & Alison Smales, 2014), has ordered a referendum for this October, to give him the mandate to resist the EU imposing a refugee quota on Hungary. If, as anticipated, Orbán wins his referendum in October, then that puts Hungary (and presumably the rest of the V4) on a collision course with the European Council and the European Commission. 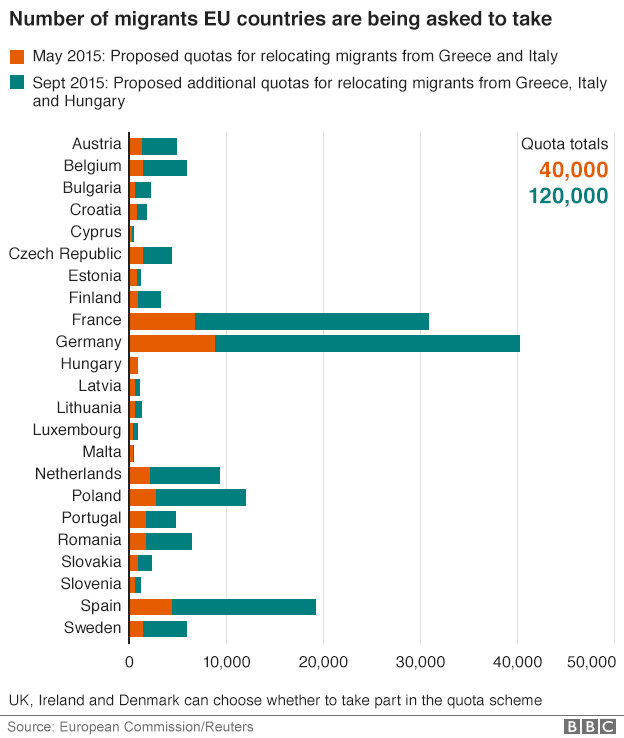 Against the explicit objections of the V4, the Council imposed a quota system for member states to take in refugees – reflected in the graphic below. Merkel’s response to Orbán was to go on an ARD TV current affairs show and exclaim it was her “damned duty” to help refugees (Tony Paterson, 2015). On the face of it RED’s exploitation of PURPLE/BLUE nationalism looks like ending one of the EU’s 4 founding principles or ‘freedoms’, at least as far as Hungary is concerned: freedom of movement. Again, this puts Orbán directly at odds with Merkel. Less than a week after the Brexit result, she was widely reported – eg: Gavin Gordon in The Scotsman – as saying, in response to Brexiteers’ claims that the UK would still be able trade with the single market while restricting immigration, that freedom of movement was non-negotiable. Merkel’s BLUE/GREEN rigidity on freedom of movement yet could prove the biggest risk to the future of the EU in the short-term. She’s effectively lost the UK over the issue of immigration. If Orbán wins his populist mandate and refuses to accept the migrant quota, Hungary will almost certainly be joined by the others in the V4, bringing relations between the EU and the V4 to crisis point. The migration issue is also feeding the growth of the far right and their exit referendum demands in the Western European countries. So the meaning of ‘freedom of movement’ has to change with the times too. In 1952, it meant workers in the coal, iron and steel industries could go to live and work in those industries in other member states. In 1958 that was broadened to mean anyone could move to any other part of the EEC to work. It was the Maastricht Treaty (1992) which allowed people who were ‘non-economically active’ to go to live anywhere they liked in any EU state. Given PURPLE’s concerns about migration right across the EU, it’s that Maastricht provision which needs to be ‘walked back from’. It’s no use politicians thinking with more complex vMEMES criticising people for thinking with less complex vMEMES. As Abraham Maslow (1956) established, progress can’t be made up the Hierarchy/Spiral while lower needs – in this case PURPLE’s need for safety-in-belonging – are not met. In the current climate, member states need to be able to have some degree of control over the number and type of ‘invaders’ they let in. That might be a disappointing step backwards for the Integrationists…but this is the current existential reality which hopefully Merkel, Hollande, etc, will face up to. In different circumstances in the future, it may once again be possible for the ‘non-economically active’ to travel and reside where they please. A reinterpretation of the ‘freedom of movement’ concept appropriate for the current times allows further questioning of the foundations on which the EU is built. There has been more than a shade of GREEN egalitarianism in the way the EU has developed- understandable in one sense because the starting point in 1952 was 6 equally war-ravaged nations trying to rise from the ashes of Europe through a collective effort. But, as Alan Tonkin’s article demonstrates so eloquently, the 6 have not all developed equally and the additional members have certainly not been equal to the likes of Germany, the UK and even France. Some, like Poland, have developed impressively. Others, like Romania, remain mired in poverty and economic under-development while yet others, like Greece, have financed short-term affluent living with non-existent revenues. So, given the major differences in values between West and East and the differences in economic performance primarily between North and South, the EU cannot be sustained as a club of ‘equals’. (Especially, if the UK, the club’s second biggest economy, does leave.) So there needs to be a major restructuring of the EU which reflects these differences but can provide coordination and a forum for cooperation. In this concept, the ‘Eurozone Union’ is for those members who want to push integration forward so that, in time, they effectively become one state. There should also be a representative body for those members who use the euro but do not want to integrate. The ‘Eurozone Council’ has the remit of coordinating economic and fiscal policy between the 2 euro groups to the degree necessary that both groups can achieve their objectives without one group being disadvantaged. 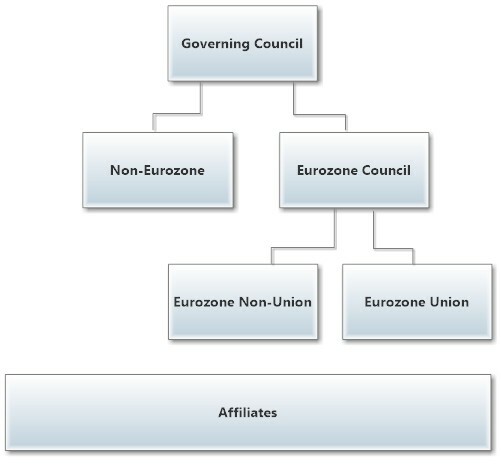 The ‘Non-Eurozone’ is a representative body for those members that do not use the euro. The ‘Governing Council’ would have the overall responsibility of balancing the differing values and interests and, in light of that responsibility, global concerns outside the EU that need to be addressed. In that sense the Governing Council would have both strategic and management functions. The ‘Affiliates’, as now, are countries like Norway and Switzerland which have access to the single market but no influence on decision-making at any level in the EU. Of course, there would be far, far more to such a restructuring than I have outlined; and there almost certainly needs to be 2nd Tier thinking involved to craft such a flexible system of checks and balances and then make it work. The EU can be saved! There is still a tremendous amount of goodwill towards the EU from within its member states. The Independent’s Caroline Mortimer notes a survey by Emnid for the N24 news channel found 75% of Germans are still in favour of membership while the Evening Standard’s Tom Marshall reports Scandinavian polls showing support for the EU in Denmark up from 59.8% to 69%, from 56% to 68% in Finland and from 49% to 52% in Sweden. As for the UK, there have been ‘We are the 48%’ protest marches, legal challenges initiated to slow Theresa May’s new government’s triggering the Article 50 withdrawal process and a petition for a second referendum which has collected well over 4 million signatures. So the EU has much support among its constituent peoples. However, its vision, its structure and its governance are no longer adequate either for what it has become, the needs of its peoples or simply the times. The Brexit vote does indeed need to be a “wake-up call”. Fundamental, radical reform needs to happen…and it needs to happen pretty quickly. Where are the visionaries for our new Europe? So the Turkeys did vote for Christmas?!? Is Theresa May going to bring about a Constitutional Crisis? Most of it is right on spot. I would not consider Merkel to be that green (she might have had a green moment) AND it was also a bad timing in the summer break of what she said and how the media interpreted it in a green way – for her it was much more a pragmatic orange decision with some green flavour I guess. Blue-green is an issue, particularly in Germany in general, specially if it is linked to a rigid belief in laws and principles that then are not very diplomatically imposed. I do see here a danger, it is not that we do not have a strong orange… and it has been very much linked to benefit Germany alone – also this was part why the reform in the south was not really pushed for. Why not lend the Greeks money, make them believe it is easy and just let them invest it in our economy? Because on the long run it back fires! When it comes to the EU – YES deep bureaucracy and VERY Blue. They are trying to push for orange with all kind of reforms and plans but they lack the implementation power and vision of 2 tier. At the same time you do find amazing and also integral informed people around – the diversity and experience is quite reassuring but the system itself I am afraid is in a dying process. This dismantling process towards the region can be observed now in Britain with Scotland and Ireland and maybe even London being disintegrated. But yes some very hard truths need to be looked at. Maybe some of the structure that Keith proposes might help to smooth the transition, yet it does look to me just as another organigram, I have seen in my 5 month in the EU a lot of them – political vision and engagement, that is something maybe less tangible but certainly more needed! Quite like this overall Keith, though I still don’t think BREXIT is necessarily catastrophic for the UK and as you suggest the referendum is at least acting as a catalyst for the EU to bring forward discussion of much needed reforms with more urgency. From a historical point of view I think your analysis would be enhanced by pointing out that a distinctive factor in the purple/blue surge in Eastern Europe and particularly the former regions of the Hapsburg Empire (Austro-Hungary) is that their historical consciousness was formed on the hostile front line with the Ottoman Empire for centuries (before being absorbed by Soviet Communism). Indeed some parts of Europe were part of the Ottoman empire itself which complicates their purple/blue identities even further and I do wonder if the tribalism which is a reaction to perceived excessive immigration in Northern Europe including the UK is of a different quality than this re-emerging nationalism in Eastern Europe with its longer historical memories of prolonged direct conflict with Islam? I suggest this formation of a distinctive identity of eastern European nations, largely falling into your Skeptical group, needs to be understood and appreciated even if concerns about Muslim immigrants & the fear of European Islamification are generally shared by the ‘new right’ across the whole EU. VERY interesting additional perspective, Tim. I hadn’t thought of the historical Hapsburg vs Ottoman Empires conflicts feeding the intense dislike of Islam in Eastern Europe. Race memory or a shadow in the Collective Unconscious. Both Jungian concepts might explain it. What may not fit so well is that, as far as I’m aware, there is no marked Islamophobia in Spain…and yet large parts of Spain were subject to Islamic invasion and rule. Though that was pre-Middle Ages and by Arabs rather than Turks. Spain’s an interesting case as far as collective amnesia is concerned. ‘The Ghosts of Spain’ from the civil war is a recent example of collective denial.